An interest in icons from the tradition of eastern Orthodoxy has swept across nearly all denominations in the past two decades. Andrei Rublev’s visual interpretation of The Holy Trinity (between 1408 and 1425) is arguably the most renowned icon of all, certainly in the West. An ‘icon’ of an icon! While old, it seems new. Rublev (1360-1425) stands as an exception to the general anonymity of Orthodox iconographers. Yet he is only a dimly known personality. The facts of his life are fragmentary. Many know of his life from Andrei Tarkovsky’s epic film, Andrei Rublev (1966) – a great work of art in its own right. More visual poetry than precise biography, this episodic portrayal, however, is faithful to the message at the heart of Rublev’s monastic service of creating icons, namely community and love. 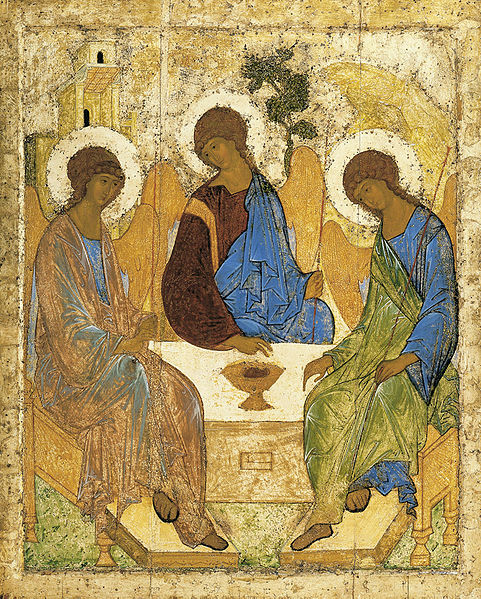 The allusive nature of Rublev’s Trinity icon is the source of its wonder. Its grace of lightness, clarity, harmony and elegance enthrall while compelling us to penetrate the mystery it imparts. Accounting for the details of this deceptively simple work soon accumulates a bounty of observations and even more wonder. Three figures with wings (presumably angels) are seated at what appears to be a stone table. Could it not also be a sarcophagus or altar? The figures at either side sit oddly on angles on both sides of the table as well as on chairs, even thrones of a sort, while the middle figure sits upon the background of earth itself. All hold staffs in their hands. Delicately their wings touch each other. Beneath the feet of the figures to left and right are rectangular slabs reminding one of a key element in representing the Resurrection in Orthodox iconography – the Doors of Hell smashed open when Christ trampled on death and delivered humanity from its dire dominion once and forever. Above and behind the three figures, from right to left, we find a mount, a tree, and a building with two clear openings. Their garments (right to left) modulate from the colours of green and blue, earth and sky, to the redemptive colours of red and blue and gold. The three figures point with distinct gestures toward a filled chalice at the centre of the ‘table’. In the attempt to identify the particular persons of the Holy Trinity from these figures, many ‘readings’ abound, attesting to the profundity of Rublev’s pictorial theology in aiding us to contemplate the truth of the Trinity. The most frequent approach seems to be to read from the left to the right, seeing the Father, Son, and Holy Spirit in that progression. Counter intuitively from a Western perspective, this icon can also be considered from the right to the left, possibly encompassing more details and biblical reference. No matter which way one meditates on this icon it drives the beholder back to the Bible. Scripture is written all over it. Although ancient exegetes saw the Trinity in the three men visiting Abraham (and Sarah!) in the text from Genesis 18, it took an iconographer like Rublev centuries later to make this exegesis visual, transforming an icon of the Hospitality of Abraham into one of the Holy Trinity. If we read the icon from right to left, there is the possibility of seeing the Father seated at the right, clothed in the creation colours of blue and green with the mount behind him, suggesting not only the primordial, but the place where Abraham took his son Isaac, as well as the mount on which the Law was given and the Son spoke his famous sermon. In the centre, we see the Son. His gesture of two fingers to the fore and three fingers folded under his palm suggest the two natures of Jesus Christ in one person and the hidden mystery of the Trinity. The blue and red of his garment intimate his royalty and sacrifice while the gold sash suggests the government will be upon his shoulder. His throne is the earth. Above him is a tree. Does it refer to the Oaks of Mamre, the Root out of Jesse, the Cross our Saviour hung on? Or all three? Finally at the left we ponder the Holy Spirit. In many ways here is the most ambiguous and curious figure of all three. Does a light shine through his garments making them more transparent than those of the other two? The configuration of either hand, even the left one holding a staff, is difficult to discern. Could the right hand gesture possibly be a variant of the formula signified by the Son of the two natures in one person and the Trinity? The building with two portals above on the left may allude to the Father’s house prepared for by the Son as well as the New Jerusalem indwelt by the Holy Spirit. Thus, the Son sits at the right hand of the Father who nods toward him. The Son inclines his head to the Holy Spirit. The movement of the mount as in a wave to the left and the tree bending to the left indicate a movement to the left toward the destination to ‘the house of the Lord’ where we shall dwell forever to behold his beauty. Their disk-like haloes add to a sense of rotation. All of this curves in a circular visual movement around a cup with a residual calf’s head from the Hospitality of Abraham standing in for the sacrifice of the Lamb of God, reminding us of our participation in the Eucharist. In this crescendo our eyes drop below and see the slabs of the Doors of Hell, slanted with precision by an expert understanding of perspective that extends behind, rather than before the viewer and includes us as we remember not only the death of our Saviour, but his Resurrection on which our faith and salvation is based. Through these angels/men Rublev helps us see the pervasive presence of the Holy Trinity, even in the tomb (Luke 24:4; John 20:12). We are drawn into an utmost intimacy of being, an embracing fellowship of eternal love. Laurel Gasque is associate editor of ArtWay. The icon of the Holy Trinity is located in the Tretyakov State Gallery in Moscow.